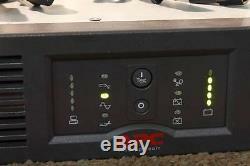 APC 2u UPS 2.2 KVA. We are offering a batch of units at a reduced price due to overstock conditions. The value of this deal can be seen from comparing our price for a fully tested, warranted and working UPS with new cells against just the cost of new cells. Once we have the stock back to normal levels the price will normalise. APC's core current rackmount UPS offering. This is a high power density pure sine wave / line interactive type unit. The unit can be cold started (without mains power) and has the reliability that comes from the market leader especially when refined with the experience learned on the UPS preceding this type. This is one of the most dependable UPS we have used. We install new batteries in all units. The batteries will be in the original Metal APC tray. This unit does not have the front plastic part. This is only a cosmetic issue and does not effect use or performance. We have included a photo of what the UPS looks like from the front - see above and below. Included 1x UPS with new batteries. 1x Input power lead 2x Output power lead Optional extras that we normally have listed and can be used in this ups are SNMP Network cards / AP9619 or 9617 for example / rails / temp probes / USB converter cables / extra input/output leads. We show some of these in the photos as an example, please note they are not included in this price. We are a distributor of Lead Acid batteries. We guarantee that this UPS has brand new batteries. Please be aware the price of new cells is a large component of the UPS price when making comparisons. New cells normally last for 3 to 5 years. We thoroughly test all UPS. This includes a heavy load power failure simulation. We are UPS Experts and our company specialises in UPS and associated hardware. This means you can have confidence in the hardware we supply, and we can provide our customers with excellent product support and guidance. Recently we have noticed that many other listings for UPS that are not ours have text that I wonder if we originally wrote as its sounds very similar. That is OK and imitation is a great form of flattery, but its worth remembering who offers 9-5 support, has 15 year trading experience and warehoused stock with full engineering facilities. This gives us the ability to provide a level of support and service which cannot be imitated. Perhaps these lines will be copied in due course? The cosmetic condition of the unit is A-Grade used. This means that signs of previous use should be expected. Any marks will be cosmetic only and we do our best to refurbish as necessary. Please use the pictures as a guide. The unit is fully functional. All of our consignments are sent fully insured on a 24 hour service with our carriers. We cover all problems that occur in transit. In normal circumstances We will dispatch on the day ordered (pre 2PM). We have the packing materials to make sure that there are no problems in transit. Our warehouse is based in the UK. The item "APC 2200 2U (Rack) UPS -NF/OC- Brand new batteries 12M RTB Special offer" is in sale since Tuesday, March 15, 2016.